Prime Minister Narendra Modi speaking at BJP's manifesto launch in New Delhi. New Delhi (India), Apr 8 (ANI): Prime Minister Narendra Modi said 'nationalism' is Bharatiya Janata Party's (BJP) inspiration and 'good governance' their mantra while releasing the party's manifesto for Lok Sabha elections on Monday and thanking the people for their support during 5 years of BJP rule at the centre. 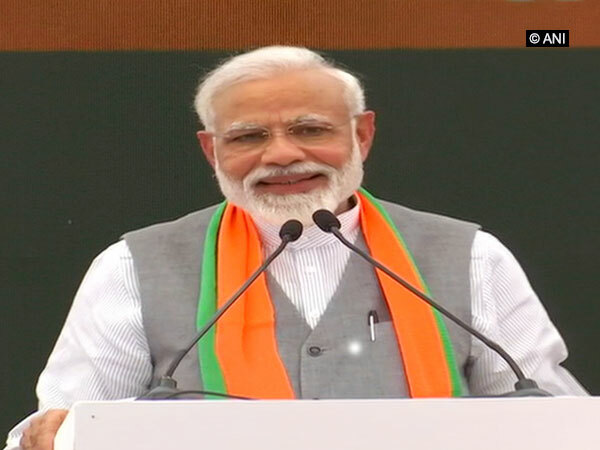 PM Modi said that five years of experience and success of the BJP government at the centre had helped create this manifesto. He was speaking at the launch of BJP's manifesto from party headquarters located at Deen Dayal Upadhaya Marg, New Delhi. "Nationalism is our inspiration, uplifting the weak our vision and governance our mantra," said PM Modi. "To develop India, development has to be made into a mass movement, and a successful result of that is 'swacchta', today 'swachhta' is a mass movement," he said. "Our society is multi-cultural and there is no one shoe fits all kind of a solution. That's exactly why we have tried to include multi-layered routes to development in our manifesto," said PM Modi, "We have set 75 well-defined resolutions in our manifesto that we can fulfil in a time-bound manner. We are moving forward with 'one mission, one direction'," he added. "In 2047, India will complete 100 years of freedom. The country you build from 2019-2024 will pave the way, prepare the foundation for that India," PM Modi spoke to the people. BJP president Amit Shah, union minister Sushma Swaraj and other prominent faces were also present at the launch of BJP manifesto on Monday.